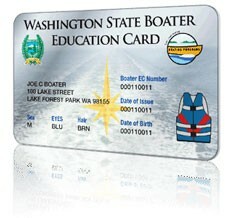 Need your Washington State Boating Education Card? The U.S. Coast Guard Auxiliary San Juan Islands Detachment is offering a free Washington State Basic Boater Education Course on San Juan Island. The two-day class will be held on Thursday evenings April 4 and April 11, 2019 at Skagit Valley College, San Juan Center. The center is located at 221 Weber Way (adjacent to Friday Harbor Airport) in Friday Harbor. The classes will be held from 6:00 p.m. to 9:00 p.m. Pre-registration is required and the class is free. Everyone wishing to learn or share their safe boating skills as well as review our local boating regulations is invited to attend. Upon successful completion of the course, attendees may submit a copy of their individual “Certificate of Accomplishment” with $10 for issuance of a Boater Education Card by the Washington State Parks & Recreation Commission. All Washington state residents must carry a Boater Education Card while on the water and operating a power-boat greater than 15 horsepower. This includes people over 12 years of age and applies to anyone who was born after January 1, 1955. Anyone can take this course online. However, by taking the class in person, boaters share experiences and discover new aspects of boating. The in-person class provides attendees an opportunity to explore and understand the specific challenges of boating in the Salish Sea. If you plan on boating in jurisdictions outside of the State of Washington, you are encouraged to determine what the state, territory, and/or nation’s boater education/competency requirements need to be satisfied prior to getting underway.